Sugary drinks can be good for you. Well, they can be good for your Modern Warfare 3 rank, anyway. The next installment of the Call of Duty series now has an official drink: Mountain Dew Game Fuel. That's not the only good news for fans of videogame-themed beverages either; the folks over at Mountain Dew have created a brand new, limited edition flavor as well. Besides the "classic" citrus cherry flavor, the Modern Warfare 3 range includes a "tropical" flavor, which presumably tastes like mango or passion fruit or something. 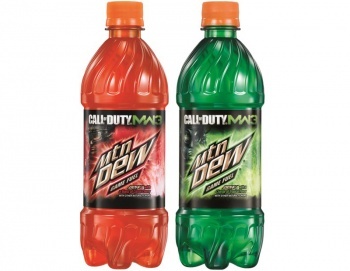 Mountain Dew will also offer promotional codes that grant double XP in the game's multiplayer. If the idea of double XP sounds good, but quaffing copious quantities of sugary drinks doesn't, you can also find the codes in packs of Doritos, which, while still not an especially healthy option, won't rot your teeth out of your head. Mountain Dew Game Fuel debuted as an actual brand back in 2007, as a promotion tie-in for Halo 3. The brand then took a nap for a couple of years until the release of World of Warcraft branded drinks in 2009. This time there was were flavors available: Horde Red and Alliance Blue, or citrus cherry and wild fruit, respectively. Our own Earnest Cavalli, who got the dubious honor of reviewing the drinks, said that the WoW range was "at best, an enjoyable diversion, and at worst, [not] entirely offensive." The Modern Warfare 3 Game Fuel launches in October. Modern Warfare 3 itself comes out for PC, PS3, Wii, and Xbox 360 on November 8th.